The Boston-based General Electric is exploring a sale of its electrical engineering business, according to Reuters. General Electric Co. (GE - Get Report) appears to be moving ahead with its plan to divest approximately $20 billion of assets, and while asset sales could buoy the stock price, there are other hurdles that remain for the beleaguered industrial conglomerate, analysts said. Boston-based General Electric is reportedly exploring a sale of its electrical engineering business, according to Reuters, citing four people familiar with the matters. The company bought the business, which was previously called Converteam, in 2011 for $3.2 billion, but "is expected to fetch less than what GE paid for it," Reuters reported. GE is looking to for ways to sell the unit before launching an auction process, the sources told Reuters. A GE spokeswoman declined to comment. If a sale were to proceed, it would be the latest in GE's plan to trim assets to focus on its core businesses: aviation, healthcare and power. The company reached a deal last month to sell its overseas lighting business to a company controlled by the former head of GE Hungary for an undisclosed amount. In November 2017, CEO John Flannery, who was under pressure from activist investor Trian Partners to simplify the industrial conglomerate with a market capitalization of about $131 billion, outlined his plans to exit the lighting and locomotives market. "Complexity has hurt us," Flannery told investors at the time. "We have not performed well for our owners. The management team is completely devoted to doing whatever it takes to correct that. Going forward, we really just have to focus on how we can create the most value from the portfolio of assets we have for our owners. We are going to do that with a very dispassionate eye." In mid-January, Flannery hinted at further organizational restructuring efforts as he continued to review the portfolio and its structures to ensure the businesses have the strategic flexibility to maximize potential value. Chief Financial Officer Jamie Miller said at the Citi Global Industrials Conference in late February that GE has a "line of sight" on the first $4 billion in assets sales. Miller noted that the divestitures could cut cash flow by less than $500 million in 2019 but should not affect cash flow this year. Regarding some of the bigger assets on the block, Miller said that GE is contemplating "spins or splits or other forms of transactions" that would create value for the shareholder. "GE Industrial is expected to raise $4 billion to $5 billion from pending asset sales by mid-2018 and an estimated $12 billion to $14 billion in net cash proceeds by year-end 2019," William Blair analyst Nicholas Heymann wrote in a March 9 research note. Like Miller, Heymann expects the assets sales to generate material cash without affecting earnings or cash flow. 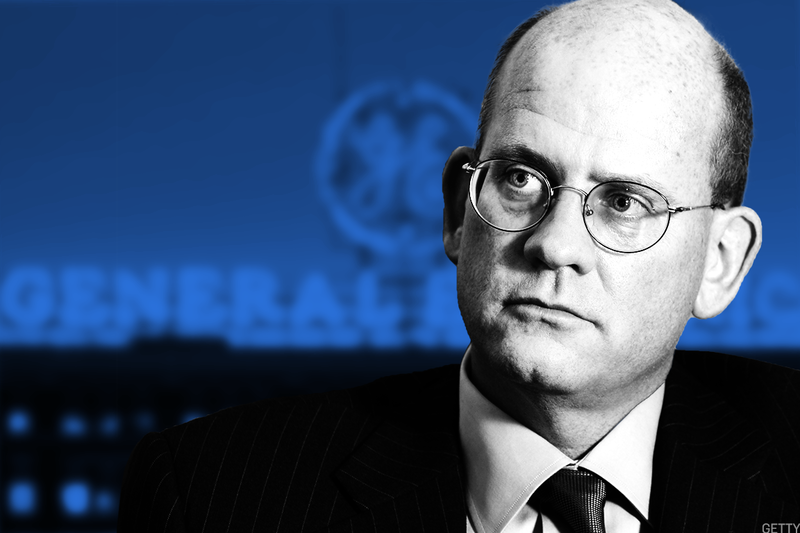 GE's near-term hurdles include several regulatory investigations and shareholder lawsuits. Miller said in January the company is "cooperating fully" with the probes. There is also further downside risk given the underperformance of Alstom, GE's European-based power company, Deutsche Bank analyst John Inch said in a March 9 research note. "Alstom, GE's largest acquisition in its history, has significantly surprised to the downside since GE acquired the company in late 2015," said Inch, noting that the global power market slow-down and other execution issues led to the unit's poor performance. "We expect [the third quarter of 2018] could result in a sizeable Alstom impairment," he continued. "For context, approximately $22 billion of Alstom [goodwill] and intangibles would equate to more than 34% of GE Industrial's $64 billion of book value." The bearish Inch has a Sell rating on GE shares with a $13 price target. Despite challenges in the company's power unit, the performance of GE's aviation and healthcare business, which accounts for more than two-thirds of the company's estimated 2018 earnings and free cash flow, remains resilient, Heymann said. "Once the regulatory reviews and shareholder lawsuits are dismissed or settled, we believe GE's focus on better-than-expected free cash flow and accelerated pace of asset sales are likely to enable the shares to return to a 'normalized' valuation of 20 times trough 2018 adjusted EPS of $1.00 to $1.07, or a valuation in the $20 to $22 range," said Heymann. William Blair has an outperform rating on GE stock. Shares of GE rose 1.1% to $15.10 in Monday trading on the New York Stock Exchange.